Gas cloud harvesting is the process of collecting gas from interstellar clouds, for use in combat booster and Tech III production. It is accomplished by locating a nebula in known space or a fullerite reservoir in wormhole space, and collecting it with a gas cloud harvester module. The two types of gas are both found in cosmic signatures which need to be scanned down in order to harvest. Mykoserocin and cytoserocin, which are used to produce combat booster drugs, are found in nebulae in known space. Mykoserocin, which is used to make the milder and less profitable Synth boosters, are found in high and low security space, while cytoserocin, which can make the more effective but dangerous forms of boosters, is found in low and null security space. Nebulae are rare in high sec, and more common in low and null sec. Mytoserocin and cytoserocin are further broken down into eight "flavors", each used to create a different booster effect. Unlike most exploration sites, nebulae are not randomly distributed throughout space. Each flavor of gas will only spawn in one region, and some regions will never have a gas site appear. Additionally, within the gas type's region, there is one 'hot spot' constellation where at least one site will always be present. Mykoserocin tends not to be very profitable to harvest, as demand for Synth boosters is low. Cytoserocin, however, is fairly profitable, although more hazardous to acquire. Cytoserocin gas clouds can also be found in level 4 mining missions as well, but the varieties present have no use beyond turning in to complete the mission. Nebulae are gas sites that contain either mykoserocin or cytoserocin, and are found only in known space. Once spawned, they will despawn either when fully harvested, or after three days elapse. Rarely, nebulae may include loot cans containing blueprints or skillbooks related to drug use or manufacturing. See also Chemical Labs. Nebulae found in nullsec may spawn hostile pirate NPCs. Additionally, nullsec nebulae are unstable. Everytime a Gas Cloud Harvester finishes its circle there is a chance for 1000 damage to harvesting ships in the area. For some clouds at least, this damage is pure thermal. But this is not confirmed for all types of clouds. Fullerenes are used in Tech 3 production, and can only be found at sites in wormhole space. It comes in several different flavors of varying value. Fullerite gas sites spawn in all classes of wormhole, but the valuable Instrumental Core Reservoir and Vital Core Reservoir will only spawn in C5 and C6 wormholes. Most fullerene sites are empty when first warped to, but will spawn several Sleepers after a certain amount of time, usually about 15-20 minutes. Thus, it is possible to "ninja harvest" wormhole gas sites by harvesting gas until the sleepers arrive, and then warping away before they can attack. However, the Ordinary Perimeter Reservoir starts with 5 sentry drones, which will blow up any Venture that warps there, and should be avoided until they are cleared. Most fullerenes are very profitable, though dangerous to harvest. Harvesting a gas cloud is very similar to mining an asteroid. Equip the appropriate harvesting module to a ship, locate a gas cloud, approach and target it, and activate the harvesting module. At the end of each module cycle, gas will be deposited into the cargo hold or ore bay. The visual effect of the harvesters is much more subdued than mining lasers, requiring you to zoom the camera very close to the ship to see. Make sure you have gas clouds displayed in your overview, as they are not selectable by default. 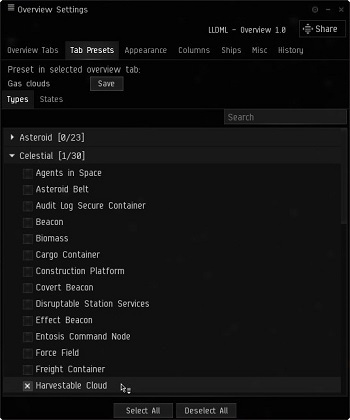 To do this, right click the overview, select open overview settings, select the filter tab, open the celestials folder, and check the Harvestable Clouds box (see screenshot right). Gas can be stored in the ore holds of specialized mining and hauling ships even though it is not technically an ore. Units of mykoserocin and cytoserocin are bulkier than individual ore units at 10 m3, while the various types of fullerite gas range from 1 to 10 m3. The range of the harvester module is much shorter than a mining laser at only 1.5 km, but the clouds are large and non-collideable. Gas harvesting has very few skills related to it. The primary skill is Gas Cloud Harvesting, which can be bought for 30M ISK from the specialized NPC vendors, or marked up PC sell orders. This skill is trainable by alpha clones to level II. This skill requires Mining IV. You can only use one gas cloud harvester per trained skill level. Note that this is very different from normal mining, where the number of mining lasers is not determined by skills. Getting the skill to 5 allows for Tech 2 harvesters to be used, which have 50% increased yield over Tech 1. Gas Cloud Harvesting should be trained either to 2 (to equip two harvesters on a Venture or Prospect) or 5 (to use T2 harvesters). Additionally, Ventures and Prospects decrease their gas harvesting cycle duration with the Mining Frigate skill. This is the only other skill that increases gas harvesting yield. General fitting and tanking skills are also recommended in order to safely fly a well fitted harvesting ship. To get gas, you need gas cloud harvesters and a ship to put them on. There very few real options in fitting a gas harvesting ship. Unlike regular mining, there are no modules or rigs to increase yield. There are no gas equivalents to the Mining Laser Upgrade. Gas cloud harvesters are placed in the high slots and require a turret. For each level of the Gas Cloud Harvesting skill you can fit one additional gas cloud harvester (up to a total of 5 at skill level V); all gas cloud miners have a range of 1.5 km (the shortest of any of the mining modules by quite a margin). Note that the table below lists yield per minute (to make it easier to compare modules), while most in-game sources will list yield per cycle. Click on the column headers to sort the table; mouse over them for a more detailled explanation. More information: Skills - Tech and Meta levels. The two meta 1 gas cloud harvesters have lower fitting requirements than the meta 0 module, however, even an average-skilled pilot should have no problem fitting a Venture with two meta 0 gas cloud harvesters. The two meta harvessters are in practice like storyline modules with low fitting and are only available from specific static sites. The tech 2 module has 50% more yield than its tech 1 counterparts, and is therefore a very worthwhile upgrade despite the long skill training time (and the slightly more demanding fitting - although it should still not cause problems for most miners). The Syndicate harvester (obtainable from the Intaki Syndicate LP store), is very rare, expensive, and almost never worth using unless you need every last drop of CPU fitting for other modules. While gas cloud harvesters can be mounted on any ship with turret slots, only the Venture and Prospect have bonuses to their use. A Venture with two harvesters and Mining Frigate trained to 4 has the equivalent yield to an unbonused ship with five harvesters. Additionally, it is far more agile than any ship that could fit five harvesters, and has a specialized ore hold for the gas. Thus it is by far the most common ship to use for harvesting gas. The Prospect has the ability to fit a Covert Ops Cloaking Device, giving it more safety in the hostile environments that the more valuable forms of gas are found in. It also has a larger ore hold for the gas, and a larger regular cargo hold allowing for a mobile depot to be carried. However, it harvests at the same rate as an equivalently skilled Venture, and is considerably more expensive. The Eifyr and Co. 'Alchemist' Gas Harvesting is the only implant range which affects gas harvesting. It reduces gas harvester cycle time, and is available in 1%, 3%, and 5% varieties. They are sold in most LP stores. Gas does not have to be refined in order to use it, as ore and ice products do. It can be used in Tech III production by turning it into a polymer using a Standup Hybrid Reactor I (see Tech 3 Production#Polymer Reactions). The difference in value between gasses can be extreme, due to the scarcity of the gas and the value of the end products. While C320/540 is highly valuable, the risk versus reward is often too high for beginners. Many find that a more manageable target is to harvest C50 as the risk is low and the reward is decent. Harvesting C320/540 will normally require several people working together, which usually means using haulers and a dedicated scout. Fuzzwork - The Forge Gas prices - measured in isk / Venture load. This page was last modified on 18 March 2019, at 09:18. This page has been accessed 543,507 times.